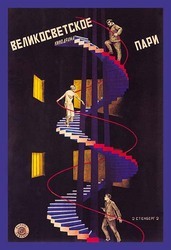 Georgii Stenberg (1900 - 1933) and Vladimir Stenberg (1899 - 1982) were Russian artists and designers. The innovative visual aspects of their Constructivist posters included a distortion of perspective, elements from Dada photomontage, an exaggerated scale, a sense of movement, and a dynamic use of color and typography. Their images seem modern and are very highly prized by collectors.